Founded in 1943, ReSound is a Danish manufacturer of hearing aids. Committed to helping people rediscover hearing so they can live rich, active, and fulfilling lives, ReSound has produced some exciting hearing technology through the decades. ReSound is responsible for several important industry firsts: an open-standard digital chip, Wide Dynamic Range Compression (WDRC) sound processing, and Digital Feedback Suppression (DFS). ReSound provides wearers of their hearing aids with natural, clear sound and a comfortable listening experience. ReSound conducts research worldwide to create technology that is applicable to real life situations. Now with offices in 25 countries and distributors in more than 80 countries, ReSound continues their mission to provide people worldwide with sophisticated hearing technology. As the “world’s smartest hearing aid,” the LiNX2 is the second generation of ReSound’s LiNX Made for iPhone hearing aids. The LiNX2 builds upon its predecessor’s success, with an updated processing platform and improved new features. LiNX2 offers wearers exceptional sound quality, speech understanding, and spatial awareness. Coupled with wireless accessibility and adaptability, the LiNX2 allows wearers to seamlessly engage with any listening situation. 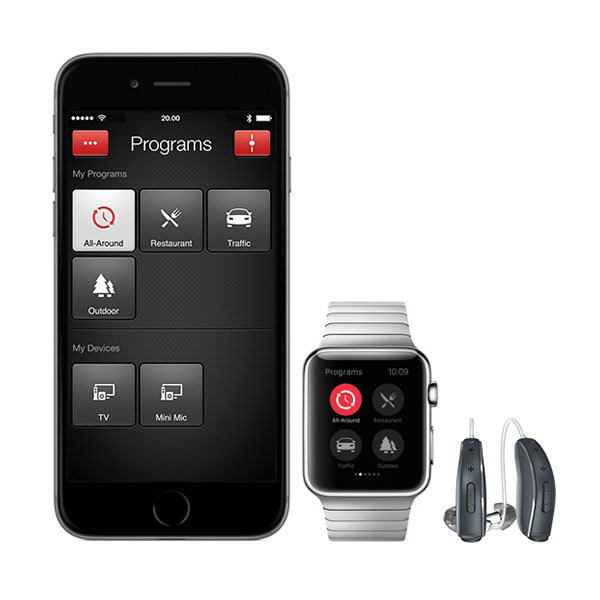 As a Made for iPhone hearing aid, LiNX2 has the capability to connect wirelessly to smartphones. With this connectivity, wearers of the LiNX2 are able to stream phone conversations, FaceTime, music, and other media directly from the iPhone to the LiNX2 hearing aids. Using the iPhone’s GPS, wearer preferences are geo-tagged and stored. When wearers return to archived locations, LINX2 automatically adjusts to wearer preferences. This provides a highly personalized and seamless listening experience. In terms of listening experience, the LiNX2 offers several excellent features to support the hearing process. Surround Sound assists wearers in locating the source of sound and provides 360 degree spectrum of sound. New Binaural Directionality II simulates a natural binaural listening experience and the clearer signal of sound supports the brain by giving it a more detailed picture of the sonic landscape. Spatial Sense supports the brain’s natural ability to process and locate sounds. LiNX2 also improves speech recognition features, ensuring that every conversation is heard. All together, these features of LiNX2 supports the brain’s natural ability to process sound, recognize speech, and help situate wearers within their surroundings by simulating normal binaural hearing. With the foundational features of WDRC and DFS, wearers have a clearer picture of sound, without the distractions of feedback buzzing and whistling. With the iSolate nanotech protective covering, the LiNX2’s construction is discreet and resilient. It defends the hearing aid’s electronic components from dust, water, sweat, earwax, and the elements. SureFit, a new ergonomic design, may be customized to wearers’ ears for exceptional comfort. For people who suffer from tinnitus, the LiNX2 includes a sound therapy feature with Nature Sounds to provide relief. With the ReSound Smart App, ENZO2 wearers are able to connect wirelessly to their smartphones. Through this app, wearers can make adjustments to program features and volume on their phones. For ENZO2 wearers who need an extra boost, the Live Listen function on the Smart App allows people to turn their smartphones into a portable assistive listening device. The iPhone microphone picks up and amplifies sounds that ENZO2 wearers wish to hear, and delivers it directly to the hearing aids. It is also compatible with a range of wireless accessories in the ReSound Unite line, which streams sound from home electronic systems directly to the hearing aid. Coated in iSolate nanotech material, ENZO2 is resilient against moisture, dust, earwax, sweat, and oils. ENZO2 is also powered to treat tinnitus, helping to alleviate the frustrating sounds of the condition. Unlike other similarly powered hearing aids for higher degrees of hearing loss, ENZO2 is significantly smaller in size. All ReSound hearing aids are fully customizable to meet specific hearing needs. The LiNX2 offers a new ergonomic design, SureFit, which is molded from the wearer’s ears for maximum comfort. The LiNX2 treats hearing loss in degrees from mild to profound, and it is available in a number of styles: invisible-in-canal, in-the-ear, receiver-in-canal, and behind-the-ear. The ENZO2 is a behind-the-ear hearing aid, available in three power levels: Power, High Power, and Super Power, depending on the wearer’s needs. ReSound also offers hearing aids designed specifically for children: the ReSound Up Smart hearing aid. This Smart Hearing Aid adapts to the way children connect with the world and take in new information, which is crucial to their speech and language development. The ReSound Up Smart hearing aid is worn behind-the-ear leaving room as children grow, and is designed to be durable and tamperproof. ReSound also offers assistive listening accessories, such as the TV Streamer to connect home entertainment systems to the hearing aids, as well as a personal mini microphone that directly streams voices and sounds. The TV streamer connects ReSound hearing aids to home entertainment systems, streaming shows and movies directly to the ears. A Phone Clip and a Remote Control increase accessibility for wearers, while giving them ease of control over their devices and hearing aids.